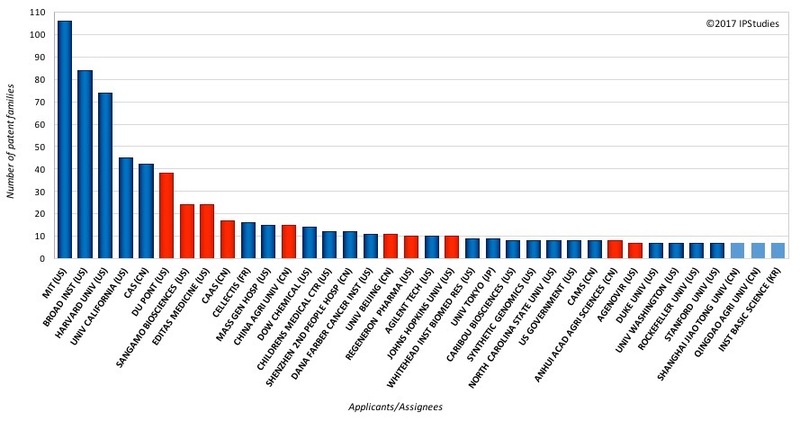 The CRISPR patent landscape keeps on steadily growing, with an additional 70 patent publications last month. We have now monitored more than 1400 patent families in our latest CRISPR patent analytics data set. In the past few weeks, our patent landscape data was quoted in the WIPO magazine coverage of CRISPR, while our expert Fabien Palazzoli had the opportunity to present his latest findings at the Cell Line Development and Engineering conference in Amsterdam and to Deftech in Switzerland. On the technical side, the patent landscape keeps on getting more intricate. For instance, we spotted this month a new patent application from one of the pioneering CRISPR patent players which attempts to mix gRNA pieces from different CRISPR systems: Engineered CRISPR cross-type-Nucleic-Acid Targeting Nucleic Acids comprising Cpfl&Cas9–NATNA. On the business side, we follow with a great interest the development of the CRISPR patent pooling effort by MPEG-LA, with a call for patents now open (submission deadline June 30). Patent applications can also be submitted, and initial submission is non binding, but it is necessary to submit at least one asset to get the entry ticket into the pooling process, with a patent pool kick-off meeting to follow this summer. On the legal side, Dr Claire Irvine and Catherine Coombes from HGF compiled a very well informed review of the pioneering patent battles status in a one-hour public webinar. We found their coverage of the PCT, UK and European filing tactics by the main players particularly insightful. They also drew attention on the positioning of some early players somewhat less discussed in the main media, such as Rockefeller university, Toolgen, the University of Vilnius with Thermo Fisher (NYSE:TMO), and Sigma Aldrich (Merck NYSE:MRK). If you didn’t have a chance to listen to it yet, here is the link. You can order online your copy of our 2017 CRISPR patent analytics report including database access to our classified CRISPR patent landscape data so you can browse and focus on the specifics of your technology and application interests. You may also subscribe to our monthly classified CRISPR patent data updates to stay tuned with the latest developments in this fast evolving, complex technology landscape. Contact us for a video demo of the database functionality! June 1, 2017 June 8, 2017 Corinne LE BUHANComments are off for this post.